(Nanowerk News) An instrument that will measure the composition of Mars' upper atmosphere has been integrated into NASA's Mars Atmosphere and Volatile EvolutioN (MAVEN) spacecraft. MAVEN has a scheduled launch date of Nov. 18. Engineers and scientists at NASA's Goddard Space Flight Center in Greenbelt, Md., in collaboration with partners at the University of Michigan, Ann Arbor; Battel Engineering, Scottsdale, Ariz., and AMU Engineering, Miami, Fla., built the Neutral Gas and Ion Mass Spectrometer (NGIMS) instrument. 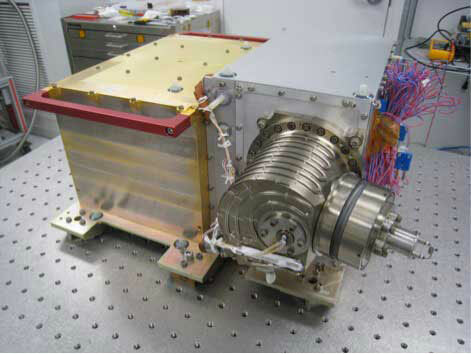 The Neutral Gas and Ion Mass Spectrometer (NGIMS) instrument, shown here at NASA's Goddard Space Flight Center in Greenbelt, Md., before its integration onto NASA’s Mars Atmosphere and Volatile EvolutioN (MAVEN) spacecraft. "The NGIMS team is delighted to provide this instrument to the MAVEN mission which will help reveal the composition and structure of the upper atmosphere of Mars and contribute to our understanding of the long-term changes in the atmosphere of Mars," said Paul Mahaffy, NGIMS instrument lead from Goddard. NGIMS is mounted on an articulated payload platform that can be pointed independently from the spacecraft. The instrument will measure the composition of neutral and ionized gases in the upper atmosphere as the spacecraft passes through it on each orbit and will determine the basic properties of the upper atmosphere. NGIMS will work with other MAVEN instruments as the spacecraft dips in and out of the upper atmosphere to study the rate of loss of atmospheric gases. The data produced by NGIMS can be used to infer atmospheric chemistry. It measures the ratios of several different isotopes that are important for understanding the long-term history of the atmosphere. NGIMS can provide a basis for models of present and past atmospheric loss. Data from the instrument can improve the understanding of the history of Martian climate and if conditions on early Mars may have been conducive for supporting microbial life. "Now that we have all of the science instruments on the spacecraft, and they each have the full capability that was intended, we can look forward to getting the full science that we have planned," said Bruce Jakosky, MAVEN principal investigator from the University of Colorado at Boulder's Laboratory for Atmospheric and Space Physics. "This promises to be a very exciting mission." MAVEN is the first spacecraft devoted to exploring and understanding the Martian upper atmosphere. MAVEN will investigate the role that loss of Mars' atmosphere to space played in determining the history of water on the surface. The MAVEN spacecraft will carry two other instrument suites. The Particles and Fields Package was built by the University of California at Berkeley with support from University of Colorado at Boulder's Laboratory for Atmospheric and Space Physics (CU/LASP) and NASA Goddard. It contains six instruments that will characterize the solar wind and the ionosphere of the planet. The Remote Sensing Package, built by CU/LASP, will determine global characteristics of the upper atmosphere and ionosphere. "The successful delivery and integration of the NGIMS instrument onto the MAVEN spacecraft is a huge milestone for the project," said David Mitchell, MAVEN project manager from NASA Goddard. "We now have all elements on board as we head into a final series of environmental tests prior to shipping to Cape Canaveral in August, and launch in November." MAVEN’s principal investigator is based at the University of Colorado at Boulder's Laboratory for Atmospheric and Space Physics. The university provides science instruments and leads science operations, and Education and Public Outreach. Goddard manages the project and provides two of the science instruments for the mission. Lockheed Martin of Littleton, Colo., built the spacecraft and is responsible for mission operations. The University of California at Berkeley Space Sciences Laboratory provides science instruments for the mission. NASA’s Jet Propulsion Laboratory, Pasadena, Calif., provides navigation support, the Deep Space Network, and the Electra telecommunications relay hardware and operations.